. Use Green Christian‘s LOAF principles – food which is Locally produced, Organically grown, Animal friendly and Fairly traded.
. Ethical Consumer magazine has ranked the high-street supermarkets as follows: The Co-operative (most ethical), Marks & Spencer, Waitrose, Morrisons, Tesco, Sainsbury’s, Asda (least ethical). If you want to find an independent alternative, check out the directory from Whole Food Action. Or if you’re lucky enough to live near a Food Assembly then you can shop from a wide selection of independent suppliers and collect your order from a central collection point each week.
. Have a look at Love Food Hate Waste for hints and tips about how to throw away less of the food that we have spent our hard-earned money on – it makes perfect sense!
. Consult the Marine Conservation Society’s FishOnline – the consumer guide to sustainable seafood, and get to know the labels you should be looking out for before you buy any fish.
. Eat less meat, and make it good quality Organic meat when you do treat yourself to it. Friends of the Earth has recently published a Meat Atlas. 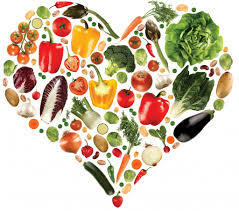 Has it occurred to you that your diet is not just a personal matter? Your choices have wide-reaching implications. There are some very thought-provoking statistics included. For example, did you know that 1 kg of beef requires 6.5 kg of grain, 36 kg of roughage, and 15,500 l of water. This places severe pressure on scarce resources – including the rainforest – and has many hidden costs.
. Grow your own fruit and veg.
. When shopping in main supermarkets look out for Fairtrade and Organic logos (Soil Association is the most strict).
. Eat fruit and vegetables when they are in season – use the Eat Seasonably calendar to find what to eat when.
. Check out local markets selling locally produced items, Localfoods or Local Farmers’ Markets might help you find those near you. If you live in London you could use Farmdrop – they make it easy to buy genuinely fresh seasonal food, direct from local producers – an online marketplace for farmers and foodmakers.
. Watch out for soy. Unfortunately use of it is often hidden from us as it is used to feed factory farmed animals. Watch this video for more information and to find out why we need to be taking notice of this ingredient.
. Do you ever think about the soil that we depend on and walk all over? Without it we would have real problems. Check out this 5min video to find out more.
. If you’re having a party, or serving refreshments after church, think very hard before you use disposable items. 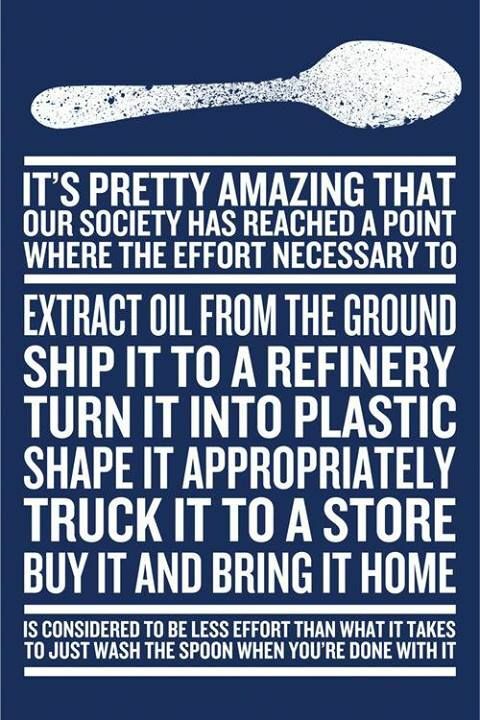 I found this illustration about a plastic spoon quite shocking. If you do have to use disposable items, have a look at Little Cherry for eco-friendly party supplies.
. Traidcraft – established in 1979 as a Christian response to poverty-fighting poverty through trade. I run a Traidcraft stall after church so I know that, not only do I love their products, so do my repeat customers!
. Suma – ethical co-operative based in the UK which sells ethical food (e.g. Organic, Fairtrade).
. Equal Exchange – a workers co-operative dedicated to the promotion of Fairtrade and Organic production methods, ensuring a fair deal for farmers and the environment.
. Tropical Wholefoods – Fairtrade importers of tropical dried fruit and nuts.
. Doves Farm – family run business based on the Wiltshire/Berkshire border specialising in Organic flour, gluten-free products.
. Veg box / meat box schemes e.g. Riverford, Able & Cole and Farmaround Organic.
. Organic milk delivered in reusable glass bottles from Milk and More.
. Vintage Roots – over 400 organic wines, beers, ciders, spirits and juices.
. Goodness Direct – the home for all things healthy, free from, eco and organic, where healthy shopping is made easy.
. Stream Farm – naturally good food: award-winning beef, trout, apple juice, pork, chicken, lamb, sheepskins.